The Magazine Store page type is ready. Now you have the opportunity to create your own Magazine with a great native look and feel. Don't lose this opportunity and start selling your products ! 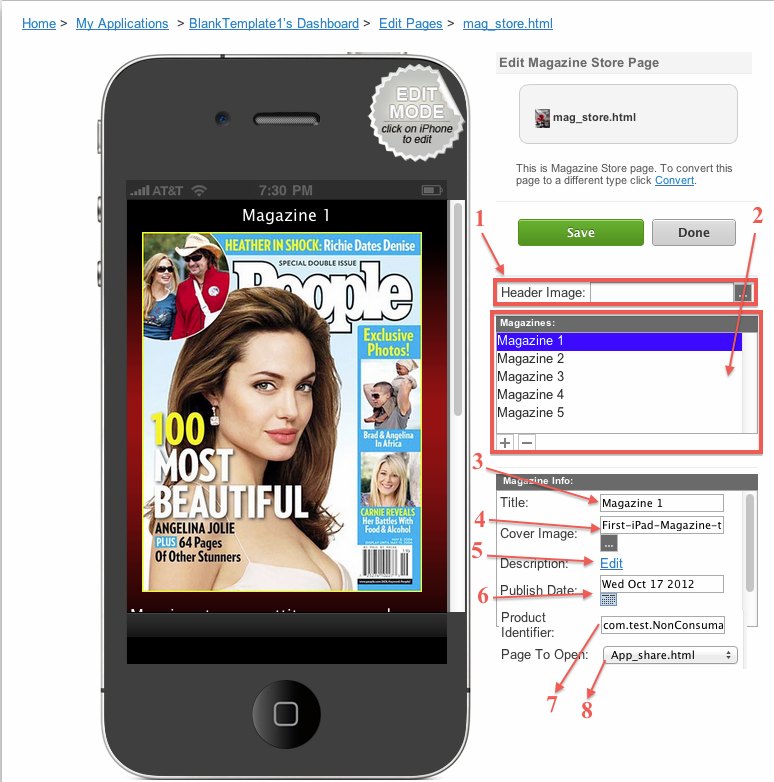 In order to add a new Magazine Store page to your app, go to Edit Pages menu then click the "+" (Add New Page) button. From the list of the page types available select Magazine Store and click the "Create" button. 1) You may set an image that will be on the top of the page. The image resolution should be 70*320px for iPhone/iPod and 100*768px for iPad. You may as well leave this field blank if you do not want to have a header image on your page. 3) Set a title for each Magazine item. 4) Set a cover image for each Magazine item. 5) Add a description for each item. 6) Set the publish date for each Magazine item. The items will be sorted on the page depending on this date. 7) For each Magazine item you need to create a Product Identifier in your ItunesConnect Account using the In App Purchase feature. 8) Selected the page that will be opened if transaction succeed. In other words, this will be the paid content that will be opened after the user pays for it. Let's see how does it look like on the device. When pressing "buy", a popup message will show up to confirm the payment. If the In App Purchase link or the Product ID were not created correctly, then a popup message with an error will show up. * Note that this page type works ONLY with Non-Consumable and Consumable In App Purchases. What is it different that bookstore? It only allow pictures files? If we only have pdf version, are we able to load into it? How many pages max or filesize max for each magazine? Each time we have new magazine, do we need to republish the app in appstore to newer version? if a buyer paid..then they delete the app..and redownload... will their purchase be recover as it is a long term subscription service. 1) Bookstore is a template. The In App Purchase is no added there, you will have to do it manually. The Magazine Store is Page type with a totally new design with many options and In App Purchase added. 2) The pictures that you see on the page are just covers. Regarding the content - you may set any page type from our list. 3) No. If the App has sync and sync button enabled, you do not have to republish the App. 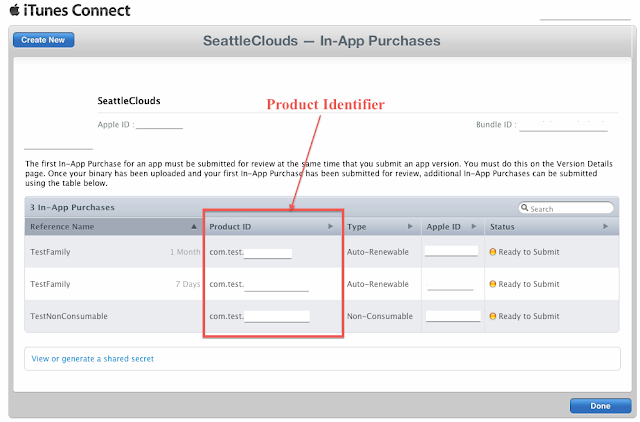 4) Yes, the transactions are made with In App Purchase. When re-installing the App, the page will check the user Apple ID. If it is the same, the purchased subscription will be recovered. Q1. Am I able to put ads within the magazine? Meaning I'd it's PDF or jog, wil I able to add advertising bar? Q2. Can I add advertising bar in the first page of app? Q1,Q2. You can add ads to this page type. You can also add ads to the pages that will be opened after the user pays. However the ads do not show up on all the pages (e.g. on PDF Reader the ads won't work). Q3. Feel free to create a donation page and then link it in the Magazine Store Page. 1.- On item No. 8 of the sample picture ("page that will be opened if transaction succeed"): Can I put a URL to a zip file so the content is downloaded and unzipped in the device? 2.- I imagine that the magazine supports background downloading, correct? If so, how does it work? 1. You can add a URL into a HTML page or Mobile Page. 2. No, the page does not support download in background mode at the moment. Is the actual magazine a pdf stored on my server or is it an eBook? The actual magazine that will be opened after the user pays the fee required can be any page type from our feature list: PDF, ePub, Mobile, etc. If the magazine is a PDF file then it will be stored inside the Application. Hi Victor, can you explain this more please. If I want to have a bunch of PDF's stored on the server, then if someone wants to load/download one it will stay stored on their iPhone. Is this possible with the bookstore? Not looking to use in-app purchae, just don't want to make them download every PDF when they initially get the App. I am very interested in the Magazine Store page type. Is anyone using it in an app that is available in iTunes? I'd like to download an app that's using it so I can see how it works, what navigation is like, etc. Also, how are new issues added to the app? I'm a bit confused about this. I read above that if the app has sync and sync button enabled, you do not have to republish the app. I am new to SC so I am not sure what this really means. Can someone elaborate, please? Also, is the Magazine Store page type for iPad specifically? I want to be sure it looks good and fits the iPad screen. And what about iPad mini's screen? I'm sure I have more questions but if I can find an app to download instead, I can probably answer them just by using the app. Q. I am very interested in the Magazine Store page type. Is anyone using it in an app that is available in iTunes? A. You can test the page in our iPhone/iPad previewer. Q. Also, how are new issues added to the app? A. You can add new issues in the Edit Mode of the Page. In the Help section http://seattleclouds.com/help.aspx , you can find a tutorial about Resource Synchronization http://seattleclouds.com/sync . Q. Also, is the Magazine Store page type for iPad specifically? I want to be sure it looks good and fits the iPad screen. And what about iPad mini's screen? A. The Magazine Store page was designed for iOS - iPhone and iPad. It should work properly on iPad Mini as well. As I have already mentioned you can always see how the page works in our device previewer. Can the magazines have multimedia features on it? Does SC have a service to create the apps for people in need of assistance? How long does it take for the app to be aproove from apple and android? Q. Can the magazines have multimedia features on it? A. Yes it can have any content supported by our service. Q. Does SC have a service to create the apps for people in need of assistance? A. We might develop custom features for our customers. For more information - please open a support ticket. Q. How long does it take for the app to be aproove from apple and android? A. For Android: 1-2 hours. For Apple: one-two weeks. I've read this thread about using "sync" with the magazine apps... but I am still a little confused. When someone subscribes for a magazine they pay month to month, it's a "subscription". Typically, someone can go back and buy/get an older month as well. If we "sync", won't it delete the old issues? I would think we have to re-submit each week/month. I've never uploaded one of these, can it be explained a little better?